These are all photos of Fulton's latest tax foreclosure rehab located at 40 Dewey Drive which is currently on the market. All appliances were bought locally. FULTON, NY – Unique to Fulton, Mayor Ronald Woodward Sr. has developed an innovative solution to tackling tax-foreclosed properties throughout the city. Woodward uses a set of guidelines to decide whether a tax-foreclosed residence is able to be rehabbed and sold at full market value. This process, seemingly uncommon in other municipalities, has been ongoing for the last ten years after Woodward originated the idea and solicited approval from the New York State Conference of Mayors. To date, the city has rehabbed and sold twelve properties throughout the city and has made demolition for rehab trades on two properties with the Oswego County Land Bank. “I budget $150,000 to rehab, out of that I project and budget $300,000 in revenue. So, we double our money on it and we’re improving our neighborhoods and the value of our city,” Woodward said. The process was not always that way, though, Woodward recalled. “I had been looking at these tax foreclosures and for years the city used to sell these tax-foreclosed properties at auctions. The problem was, you got hardly any money out of it and the people that bought it were out of towners who threw a coat of paint on it and then the neighborhoods dealt with whoever they put there. So, I said, ‘we’re not doing this anymore.’ If they need to be torn down, we’ll tear them down. If they need to be fixed up, we’ll fix them up and we’ll sell them at market value,” he explained. Woodward examines each property to determine whether the house is in a condition well enough to rehab. “The first thing I look for is the bones, make sure the house is structurally sound. I look at the sheetrock, the wiring, everything, then we do an asbestos survey. Once that comes back, if I decided we are going to rehab it, we gut it and start from scratch,” he said. The work is bid out, however, most of the time local contractors are awarded. All appliances are purchased locally through Fulton Appliance. 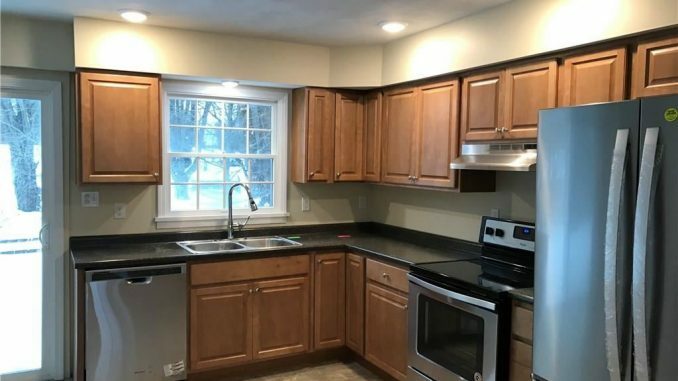 The rehabbed properties come fully equipped with everything brand new including yard work and, weather-dependent, a freshly paved driveway. “We want young people here and we don’t want them to fail the first ten years they’re in their house. This has brought people in from outside our city and buying at market value ensures they are typically employed to secure a mortgage and are paying the taxes everyone should be paying,” Woodward said. So far, this distinctive approach has paid off for the selected properties. “This has been 100 percent successful so far, every house we’ve rehabbed has sold and usually pretty quickly,” Woodward said. This year, Woodward has a goal to rehab and sell three tax-foreclosed properties. With each flip, Woodward changes forgotten, often dilapidated properties to respectable, worthy homes to brighten the look and feel of the city for Fulton residents and prospective buyers. I know this has been going on for a while…but when on this Earth does a city become a real estate agent? And we wonder why we have no money…this system is going to bite you in the britches..can’t wait for that to happen.. again don’t worry about the small stuff..what about the racing venue about to come this way… your all crooked..
Good Work Mayor Woodward, keep it up there are numerous empty properties in Fulton that could benefit from this program, keep it above board and publish the facts and costs as well as the profit for the city. And how many houses have been auctioned off with liens against them? Are they auctioned off because of the neighborhood that they are in? Wake up, Fulton is not being run as a city. It’s now real estate heaven!!!! The next change he needs to make is the code that turns multi family homes into single family homes if they have been vacant. That code backfires in every town and the property sits abandoned for years. Mr.young..what makes you a realestate expert? This city has many more problems that owning a campground which is going to cost a large dollar figure to fix and maintain…then they want to build a stair case to the river,when you can drive to it!!! Then they want to buy vacant homes!!! They can’t even afford to change over the lights to l.e.d….they stumble over dollar bills to pick up a penny…wake up Fulton ..let’s all of us go to a coucil meeting and see what and how they handle a few thousand people..